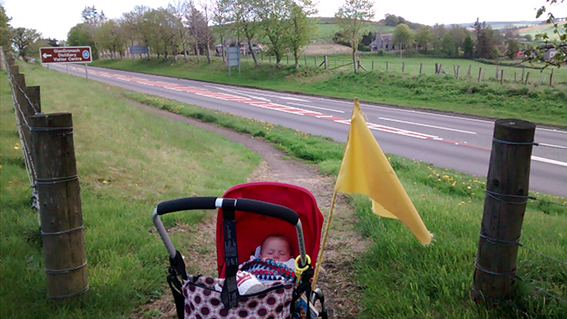 I set out this afternoon, on Deborah’s suggestion, to try and walk up Bahill with the pram. I have a bit of a false start, but I definitely tested a few edges today. My mistake was to turn left, rather than right, onto the A96. 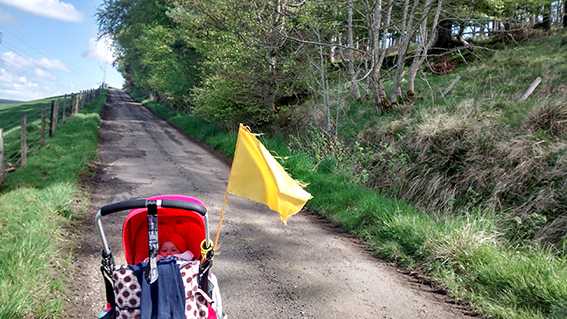 I made it because I was following the pavement, which leads along the side of the road up to the petrol station. I try the lane that turns off next to the petrol station, but end up at a house at the end and turn back. I try to continue along the main road up the hill – the footpath has run out but the grass verge is wide and reasonably passable. After a short while the grass gets longer, the ground gets softer, and it gets harder. I cross the road to the lay-by to see if there’s a way through – a path or a lane that might lead towards the hill. No joy, just roadkill in various stages of decay. I turn back and cross the road again, walking along the pavement. 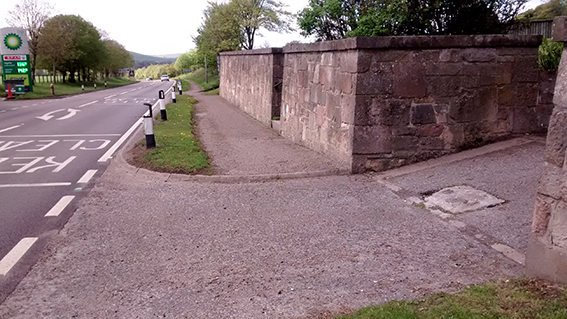 At the road into Huntly (the one for the station) I try to go the other way – walking along the grassy edge – this bit has been mown and isn’t too difficult to negotiate. After a while I cross over – the verge on the other side looks flatter. But then I see there’s a path on the other side. 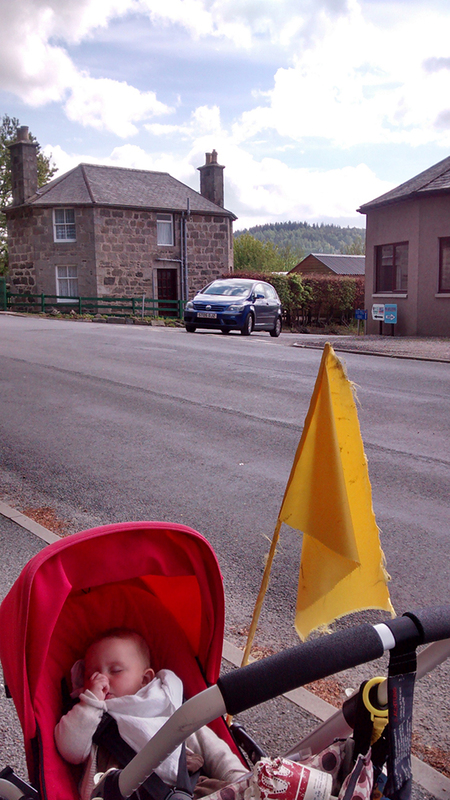 I can see the turning now, signed for Bahill, so I don’t bother crossing again. 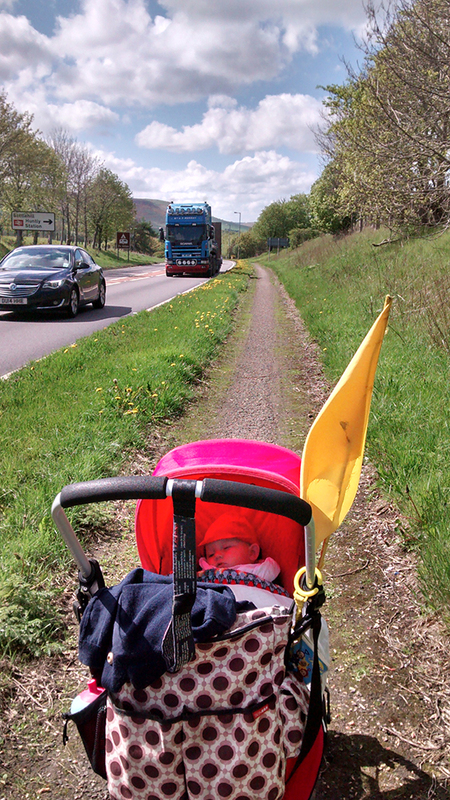 It’s not very nice, the lorries are whizzing past and it doesn’t feel like the most responsible thing I’ve ever done – walking my baby daughter along this busy road. Once I turn up the road to Bahill it changes, the lane is quiet, the sun shines, it’s not long until the traffic noise fades. 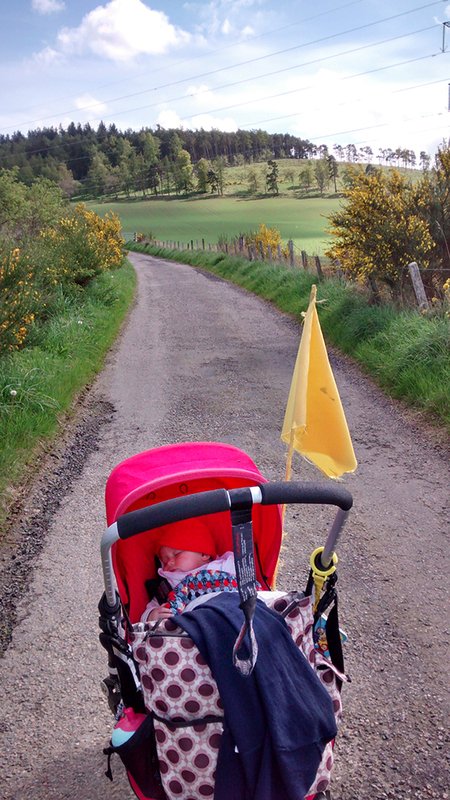 There are a few points where I worry that the road is so narrow that if a car (or tractor) came along I wouldn’t be able to get the pram onto the grassy edge, but I keep going. I’m surprised that it seems like I’m going to be able to get to the top. It’s hot and I put my scarf on my head to protect from the sun. 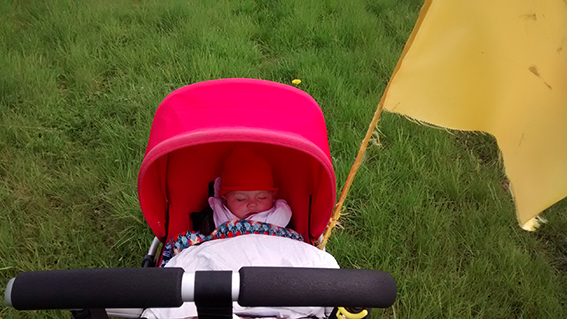 Ruby is asleep and I pull the pram hood up to protect her. 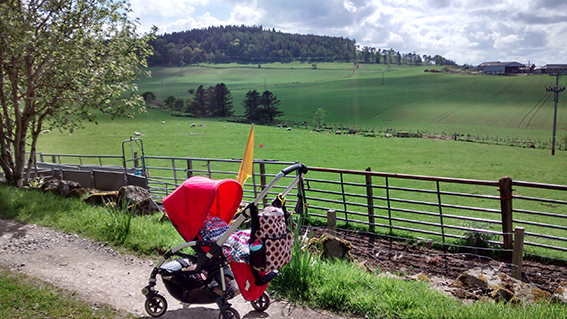 The view from the top is wonderful, I wish we could get into the woods, but even if I leave the pram and put her in the carrier I would have to climb over the barbed wire fence. It looks so inviting, but not possible. We turn around and walk back down the hill, Ruby wakes up and kick kick kicks all the way back down. At the bottom we cross the busy road to the pavement, and turn off into the industrial estate. 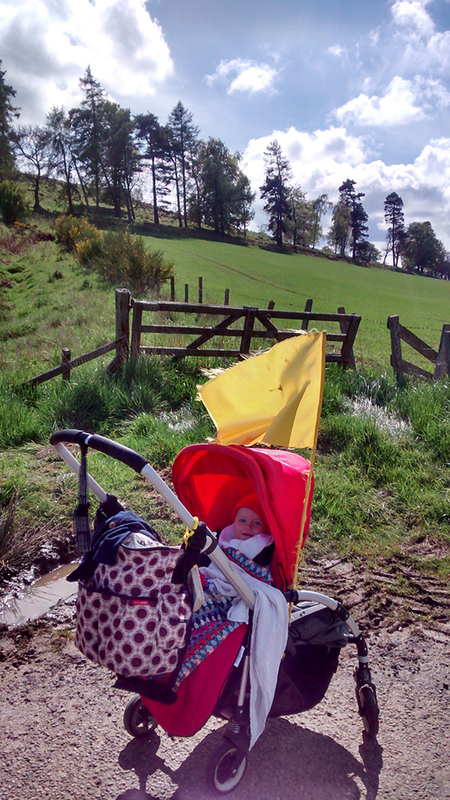 I suddenly realise that the pram blanket has gone, and we walk back to look for it, hoping it’s not all the way back at the top of the hill. A man on a bike goes past and I tell him what’s happened – he cycles ahead, and as I cross back over the busy road (how many times today?) I see him with a dog walker that I’d passed earlier – she has the blanket, picked up and passed on to her by someone in a car.